Camping is one of the most rejuvenating activities that provides a camper necessary escape from boring routine. But, since it’s an outdoor activity, its best you choose for best quality tent that can withstand unpredictable climate conditions as well as keep you warm. Finding the right tent can be a challenging experience since there are many aspects that need to be considered. For example, if you are camping with your family, you will require a tent that will be able to accommodate all of you and still leave space for you to store your belongings. Much like the sleeping bags you used, camping tents are designed for each season. For summer tents are kept light weight, have mesh for vent, and rain fly which enable you to have more ventilation. All these types of tens typically feature 2 poles only. In contrast there 3 season tents that are actually designed for summer, fall and spring weather. They have 2 poles and rain fly to protect you from weather rather than providing ventilation. Such tents do not perform well in cold weather especially when it is heavy snow. However all good companies claim their tents to perform well in rain and wind. Then there are 4 season tents that are designed for serious exposure to cold climate conditions, and feature 4 poles. They have removable vestibules, heavy fabric, and skylights for more natural lighting and mesh windows with zippers. They not only perform well against heavy snowfall, but also protect you against intense cold, high winds and UV rays. 4 poles are included so that the tent can stand sturdy against strong wind and many other wintery elements. Solid and sturdy, Kodiak Canvas Flex-Bow is easy to install, however difficult to put away. It offers a fair share of pros and cons, therefore buy or not, finally depends on your regions weather and the location. Made with Hydra-Shield, 100 percent duck canvas, it features a Flex-Bow frame to keep it stretched and sturdy. Height is 6 ft. 6 inches, so taller people can easily stand inside without crouching. 2 large, D-shaped entrances on front and back, with durable zipper that work well and never get jam. 4 sizable no-see-um mesh windows for privacy and ventilation. 2 funnel-flow for temperature management and airflow and 72 inch x 79 inch awning. It also has a customizable gear loft, organizer pockets, durable 12 inches steel rod stakes, and 1 strap & cinch storage bag. It’s only 68 pounds including all the gears inside. You can easily carry it on truck and then directly to the site. For family camping it has plenty room for 4-6 person. However for overnight stay I could recommend it for 2 persons, or for a family with 4 kids. It isn’t freestanding by any means. You cannot use it unless staked to ground. Stakes are quite heavy and takes time pounding them. However one staked, setting up is easier and just one person can manage it. Sturdy enough to face strong winds. Few reviews says that it can handle minor roof leaks, however it cannot be said to be completely water proof. So it cannot be recommended option for rainy environments. It is also susceptible to mold or mildew. Always hand it out to dry after using in wet conditions. It’s nice and comfortable having thick floor, however rolling it up is more challenging. It’s better to have a broom to sweep dirt and debris that enters each time every one come inside. The bigger issue with it is Rope fraying. Few reviews reported that zipper and awning ropes fray after few months of use, however it can be fixed by heat shrink wire wrap or by natural simulated sinew. 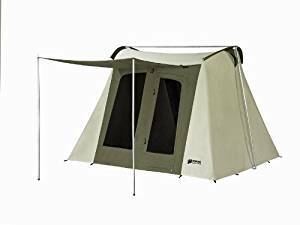 Spacious and sturdy, Kodiak Canvas Flex-Bow 6-Person Canvas Tent, Deluxe is ideal for dry family (4 adults and 2 kids), dry regions, however need proper care. Useful features, easy to setup and canvas is enough for overnight stay. Best for tall heighted people, they can stand without crouching. Ample ventilation, windows and awning. 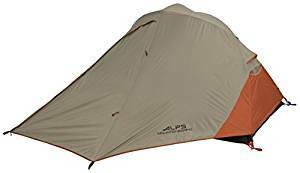 The Big Agnes Copper Spur HV UL 2 is 2 person dome tent with 2 side doors with increased space and livability through integrating steeper inside walls. Result is an excellent balance of function and comfort for best 3 season lightweight tent out there. For overnight stay of 2 person, having 2 doors means two vestibules, double space for gear storage and enough room inside and no need to be woken up each time when partner needs to go out. HV version uses single hub pole design, with horizontal cross pole that is different from previous model. New pole design makes a boxier inner space with nearly vertical walls to provide ample space to sit up or dress without touching mesh inner walls. It has extreme ventilation even when buttoned up in worst weather. To promote ventilation you can stake front walls without doors under fly. Additionally, a large air gap between outer and inner tents increases airflow and reduce inside condensation. Solid fabric on lower half of inside walls blocks cold breeze as well as provide maximum privacy with no compromise on mesh venting. Although airflow is best, there must be a rear roof vent for pitching tent less directional. 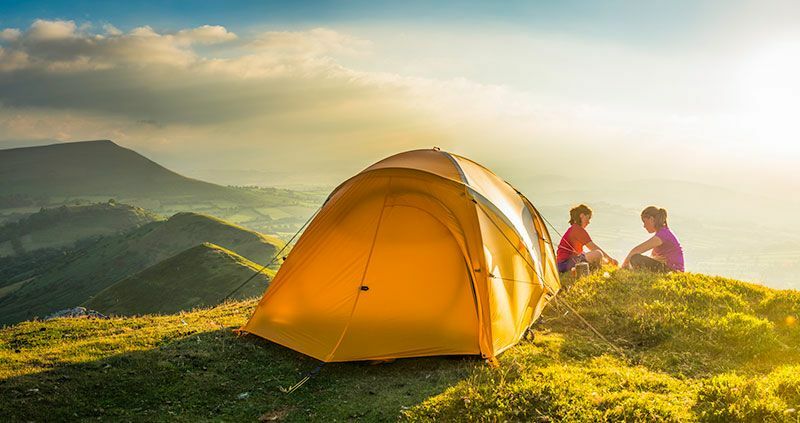 Therefore you must carefully check the direction of wind blowing before setting the tent up and keep the top vent open. It has spacious side vestibules to offer ample gear storage under cover. Doors inside are large enough to get past gears stored in vestibules without crawl over it. Rain flaps on zippers prevent rain from coming down from roof. It also has tent wide mesh pocket at head end for stashing power chargers and phones with ports for cords and headphones. Increased space than its predecessor, especially at head and foot ends and in corners. Its interior is tapered, so you will need to be cognizant when setting it up, although it’s freestanding and therefore easy to pick it up as a unit and turn it around. Its width at head end is 49 inches, tapering to 38 inches at foot end, however still possibly wider enough to keep 2, 25 inches wide pads. 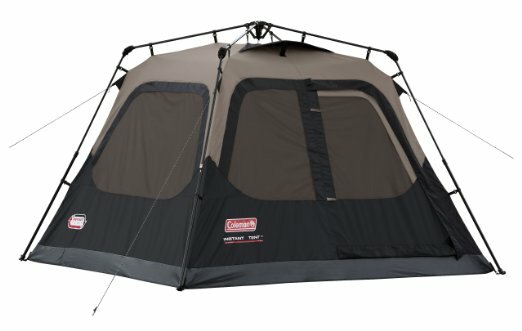 Both occupant has mesh pocket by their head to keep personal gears and tent-wide mesh pocket on roof, however no gear loft. There are many hang loops on ceiling to hang lights and other stuff. It’s easy and quick (2 minutes only) to setup because all components are color coded and Jakes Feet guide in corners, so rain fly and inner tent connect to same corner webbing as well as buckle assembly. Tent is nearly freestanding and just side vestibules need to be staked. Therefore you can easily pick the assembled tent for repositioning, until vestibule doors are not staked. It is better to stake out the corners to save it from high winds and have increase ventilation. While packing it, be careful to track horizontal cross-pole as it easily get lose or misplace. It is very easy and quick (just 2 minutes) to set it up. With Coleman Instant Tent for 4 person, you just need lay this tent down, extend the poles and spread the fabric out till they get locked. And you are ready to start settling in for dry and peaceful night’s sleep with your partners. Even a lone female traveler can manage it. Can be set on beach sand also. However it is important to set of sand pegs and to make it withstand with strong wind use all the guy ropes to give maximum support. 3 large mesh windows with rolling flaps keep your tent cool throughout the day. It also maintain steady air flow in the night. Be careful to have flap open for air circulation when use in condensation that does comes from inside tent when kept entirely closed overnight. Width of awning (pole to pole) is 1.3 meters and length is 4.2 meters. There are no side walls on awning. Inside has a solid mesh door that zip up therefore when awning is up you still have light rain protection and privacy. However at awning part of fly there isn’t any fly zipped up when it is extended. It has a fine roomy inner space for 4 persons along with headspace for tallest user. Believer you can even stand up inside without crouching. It even have enough floor space to fit in a queen air bed. Although it has enough space for 4 persons, but I would recommend it for 3. You can also use it in rainy weather and all the seasons. Externally it is 240 cm long and 240 cm wide. Inner sleeping are is 230 cm in length and 230 cm in width. Max. Head Height is 190 cm or 6.25 ft. When packed it is 12cm in Length x 25cm in Width and x 24 cm in height. It weighs only 12.7 kg therefore it is easy to carry. It inner and exterior is made from 150 D Polyester which is waterproof (1500mm). Material used on floor is polyethylene. Frame is made from sturdy steel. With this tent you can enjoy with your family for many years. However this tent is not for single person. Wall divider makes 2 separate rooms. Water proof fly can cover zippers to improve water protection. Setting it up is quick, easy and self-explanatory. It has steel uprights and fiberglass poles as well as steel stakes, to help secure tent to ground and stand against strong winds. For family camping you need a larger tent to have separate sleeping space for each person. You also need space to stretch out in. its dimension is around 10 x 15 ft. that give ample room to stretch out inside. With middle divider for separate space you get separate sleeping space. When packed it is just 12 x 30 inches that is ideal to carry and go. Staying dry inside is important, especially in rainy environment. With many other canvas tents, water may enters inside, which isn’t the case with this tent. This tent comes with rain cover which goes along and enclose the mesh nets. By this you get the appropriate protections from rain and not have any concerned for rain water getting inside. Separate entrance is great feature to give separate space to kids and parents. It has inner storage pockets to store your gears safe inside. Straight side walls for easy to put it in cots. Rain cover is very hard to zip completely and at point’s looks like it is going to tear the roof. Large windows means lesser privacy if left uncovered. 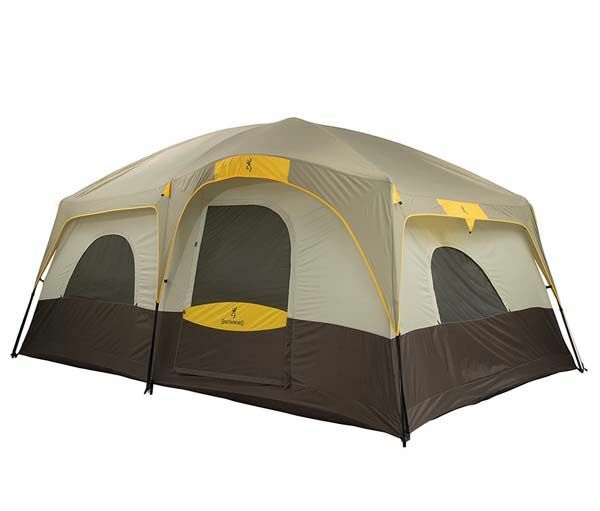 Sundome 4 person tent is part of Coleman series which is among reputable brand in camping arena for producing sturdy and quality tents. It’s easy to set up and loaded with features such as large doors, ventilators etc. It is better to cover it with warm blankets to have better sleep and pitch it on higher ground that is slightly sloping downwards. The only downside is that seam split after long use, however mostly reviews were on the positive side. Following are some of the distinctive features of the tent that makes it one of the best coleman camping tent. It’s 33 percent more water resistant then other Colemen products. Therefore no need to bother seeking shelter under rain. A larger door allow easy exit and entry with hood fly so that your partner can relax inside, even under rain. Sharing tent with family can be unpleasant, particularly without appropriate ventilation. Luckily, this tent features 2 windows to provide enough ventilation for longer and comfortable stay and having pleasant view of outside. Despite large windows, it also has mesh vent for more ventilation and protection form creepy crawlies, bugs and unwanted flies. With screened upper walls you can enjoy starry sky without installing rain guard. No need of using seam sealers because it will remain dry even under moisture. All in all it is enough ventilated and great for both hot summers and cold winters. It is easy to set up with continuous, snag free poles sleeves. It simply folds and expand in carry case and even rolls up easily to have continent storage. Also its shape is compact and wonderful look, so that your kids will love playing in your backyard. Never let unpredictable climate spoil your camping trip. This tent features rainfly for extra protection from rain. Moreover, it also has welded seams at corners to protect tent from leaky floor. You no longer need to bother about your belongings. This tent features extra storage pockets to ensure keys and wallet never lost. It comes with carry case to transport it from one place to another. 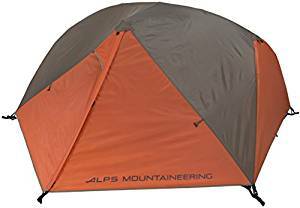 This tent is made up of durable polyester fabric which isn’t only moisture wicking but also sturdy to stand against strong wind, resist chemicls, wrinkling and shrinking. Moreover its moisture-wicking feature makes it dry up quickly after wash. It is the cost-effective tent in terms of 4 person space. Not good for high winds, heavy rain and cold weather. 10.5 pounds is bit heavy for backpacking, it is best for car camping. 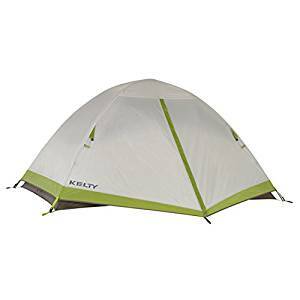 Kelty Salida is a great value at $120 for 2 person. It’s easy to set up and have all standard features, such as gear loft that other manufactures offers at extra price. Weighing 3 lbs. 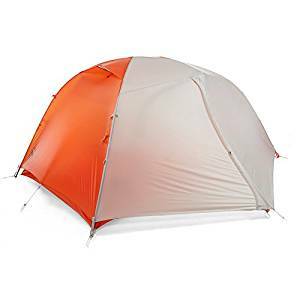 14 ounces, this tent is best for backpacking and car camping trips. This is a semi free-standing option which include 2 collapsible aluminum poles connected with shock cord that can be spent and connect cross wise to hook on inner body. Then just drape the shaped rain fly on inner part and connect it to corner clips inside tent and it’s done. In the end stake out vestibule. Main beauty of this tent is that you can wedge it into tight spaces in forests, set them on rock or on frozen grounds. They are easy and quick to set up in rain and need not to spare extra half hour fiddling with guy lines. They can also be heavier as you need to use collapsible poles, rather reusing your trekking poles, however they are convenient for those who need an easy setting. Inside is spacious for people and sleeping bags. Side walls inside are steeper to add more spaciousness. Inner tent floor is long enough to lie in 6 feet sleeping bag without touching the walls. There are ample of internal gear loops for hanging light and gear loft with base which is a nice feature, especially for drying out wet clothing and gears. This feature is mostly available on extra payments, but with this tent it is free. Tent has mesh pockets in corners to store watch or glasses nearby. Surprisingly not many brand include these pockets inside the tent. Rain Fly has unique dome-shape which is cut to fit inside just like second skin. Unluckily, this can compromise air flow with cool weather and in rainy season. There is smaller vestibule are in front of inner door tent, however it is little difficult to get a taught pitch because of shape of fly. Very quick and easy to set it up. Only 1 door for entrance and exit. It features a rare 3 pole system which is the strongest framework that make it easier for clips to snap straight into poles because of increased contact. This tent withstand virtually anything nature throws on it. A mesh roof provide wonderful star gazing opportunities. It also features extreme storage to put your mucky gear and relax simultaneously, until you have fly roof up, so that you do not get wet. Enough space for 2 persons along with storage facilities for all 3 seasons. Vestibule is 29 sq. ft. to store enough gears safely. Floor dimensions are good at 62 x 92 inches or 35 sq. ft. floor space. 3 poles makes it sturdiest, safest and most secure tent out there, however it is difficult to set up and take down either. Attachable pole clips are excellent and this tent will go nowhere even in bad weather. It feature a rugged frame along with great clips and zipper that you never need to change over time. Mesh is also very well and protects from UV rays and other elements. This is rugged tent for 2 persons and it can be used in extreme weather like hurricane and torrential downpours. It has lots of storing space and 2 doors, double wall style ensures that no heat and cold stays in. Sturdy enough to stand still in all weathers. Slightly small and just allow 2 person, no chance to invite anyone. It’s sturdiest, can withstand all weather condition and its framework is excellent. Has 3 pole frame which is a bit tricky to set up and require dedicated time. Mesh and ventilation works well. With vestibule area of 10 x10 sq. ft. and floor 27.5 sq. ft. Kelty this tent weighs only 4 pounds. It has walls made up of no-see-um mesh for ventilation. Rainfly material is sil-nylon rip-stop to keep it light weight and there is also taped seams on floor as well as PU coatings in order to ensure resistance to water and abrasion. For sleeping with your partner, there are 2 doors on each side so you don’t need to climb over each other like newborn hamsters. It also has 2 vestibules that means you don’t need to share gear space also. Additionally there are guy-out points, noiseless zippers, DAC press-fitted aluminum poles and color-coded clip construction. The poles are lightweight still strong with separate lifetime warranty. The poles are celebrated with durable option as compared to fiberglass poles. Be careful to find Kelty Upslope Tarp which adds extra 37 sq. ft. of wonderful vestibules space and add 1pound 7oz weight to your pack. There are pretty darn-cool features including stargazer, i.e. rolling up top half rainfly. Head of tent includes mesh wall, and when fly is open you can enjoy open starry sky. There are 2 built in pocket and 2 viewing windows. Pockets are slightly small with only 2 loops to hang lanterns but not gear. But 2 vestibules offer much space for storing your gear safely under shelter. No need to worry about rain invading inside. While condensation is usually a problem in tents, ventilation by mesh keep your interior dry, even when you are camping beside river. It doesn’t take long to setup. You can easily set it up alone. However it isn’t designed for fast pack option, but color coded snap clips are really helpful. Water may invade under fly when not guyed out completely. Difficult to find footprint for setup. Fly loses its star watching charm when you need to guy out. 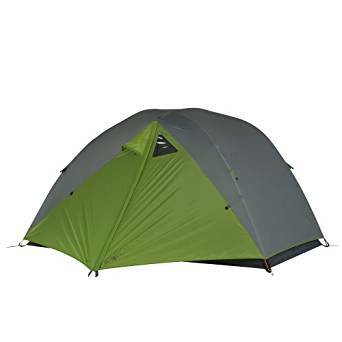 A durable option, Kelty TN 2 Person 3 season Tent is freestanding piece with several nifty features. All in all Kelty TN is best for 2 person and 3 seasons. It relatively light weight as compared to its size and water proof. With 2 door, 2 vestibule you need not to worry about moving in and out and condensation. It keeps rain, creepy crawling insects and other elements from invading inside the tent. Best for short backpacking trips in ideal weather condition. For hiking in dry conditions, internal condensation due to skin-tight rain fly will be less bothering problem because you can sleep without it or by keeping doors open. Found to be great, strong and durable tent. Suits to tall hikers and campers, and even 6ft plus can use it comfortably. Stable and highly fabulous tent. 5. Fit for 2 adults and 1 kid easily. 6. Gear lofts for keeping glasses, watches and other stuff need to keep nearby while sleeping. 9. Multi pass urethane coating covers fly to floor for maximum weather protection. 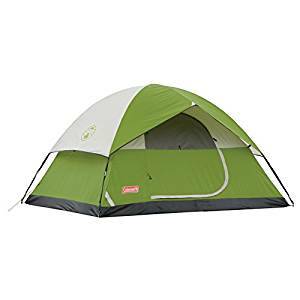 This tent is large, strong and still light weight to let you move it around. It’s good for all weather and erected quickly. Its spacious and large design allow you to stay longer inside especially when you are stuck in bad weather. It’s biggest piece with 41 sq. ft. for 3 person and 22 sq. ft. vestibule for all gear can be stored easily. Center height is 3 ft. 8 inches that makes it enough, however it cannot be high or else weather resistance factors will be compromised. Its easy to setup design along with secure tent clips makes it long lasting and attachment remains intact. It includes factory fitted seams for floors and fly walls, no water get inside and no need of repairing. Aluminum poles are strong yet light weight. High quality zippers are used to make it a swift and smooth job to open or close the doors and flaps. It can stand with high winds up to 60 mph. therefore no need to chase tents and your gears across sand dunes. You can take it on hiking, roads and highways. For inclement environment you can duct tape it to ship deck and camp in dry place. It has many nice gear pockets to store your books, glasses, jewelry, and keys. You will be overjoyed to avoid mosquitoes and other flying insects diving bombing over you. You will be glad getting in and out easily with separate doors at each end. No disturbing each other, fumbling with zippers closing and opening on wrong sides. Do You Want to Know Which Products Are Best For You? Join the community of over 10 thouand people & enjoy best products deals! We never share your email id with anyone!